Now please take a seat and don't worry yourself, my friends. I'm sure the following 77 minute movie made in 1933 will be just fine to watch. And if its not, well, blame its Director: T. Hayes Hunter; or one of his Actors: Boris Karloff, Cedric Hardwicke, Ernest Thesiger, with Dorothy Hyson. 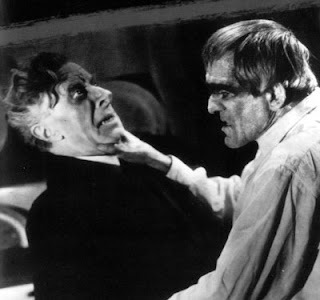 I can hear what they're saying about you, Professor Morlant (Boris Karloff). I can hear them right now, from the very next room, whispering and murmuring about what has brought them here today. I mean, don't any of of them have any respect? How dare they speak about you in such a disrespectful manner! Considering you've passed away just a couple of nights ago! But then again we know better, don't we master? We know how you swindled a special elixir from those damn pesky Arabs, and then gave it to me to administer to you, mere moments before you took your final breaths. An elixir, I might add, which has the magical ability to bring you back to life even after you've been buried in your own family crypt. So let them speak! Go on. Let your nephew Laing (Ernest Thesiger) and your niece Betty (Dorothy Hyson) wonder why you've bequeathed them with such a token sum. Furthermore, let that Arab chap and your solicitor Broughton (Cedric Hardwicke) ponder if your re-birth is possible or not. I don't care. And neither do you I suspect. Especially when what next transpires all gets rather physical, when you pop-up out of your tomb and say to me, 'Laing (Ernest Thesige)! Where the f*ck is my Arabian jewelry?'. As a divided family is unable to grieve - Nigel Hartley (Ralph Richardson) is promptly told to leave - a Ghoul is denied eternal life - and at the end of the day, Kaney (Kathleen Harrison) repels her attackers with a very sharp knife. With all due respect and no offence implied, I'd say 'The Ghoul' reminded me of one of those theatrical plays you might see one your children perform in at infant school. On a purely illustrative level, of course, this is defiantly the type of movie where the quality of its footage was somewhat murmured in tone, where as some of the performances were as lively as a soggy piece of cardboard. Obviously most of these negative attributes were largely due to the time-period this picture was made in. Sound was at its infancy, plus for the most part the acting styles were fresh off from the vaudevillian stage. Now please don't get me wrong, dear reader. In no way am I trying to imply that this horror classic was a total waste of my viewing time. What I'm trying to demonstrate to you instead is what you'll be seeing if you ever decide to sit down and watch this flick. On a more positive note though I would like to applaud the makers of this movie for being able to tell a tale despite the primitive challenges they faced. Also, as much as I wasn't too keen on the styles of some the acting, I have to admit I did love all of those scenes featuring Kathleen Harrison's character -- Kaney -- who's flirting with the Sheik made me giggle like a loon, honestly making me want to see a lot more of her on screen. Plus, in some respect I have to say exactly the same thing about Boris's portrait in this picture. Even though his presence was a fleeting one at best -- because he only popped up at the beginning and the end of this tale -- whenever he was in view you could tell that a master was at work by the way he outclassed his fellow performers. Now as for the actual story-line on the other hand, well, that wasn't too bad to follow in spite of the way it kind of meandered too and throw throughout its telling. From my point of view it was the type of tale you need to concentrate on if you want to understand what's happening from one scene to the next. If you blink or get distracted momentarily, please get ready to hit the 'rewind button' or else you might miss a crucial part of the plot. Hey! Wait up! While I'm on the topic of 'hitting re-wind', I think this is a pretty good time for us to check out the following filmic facts. (1) 'Gaumont British' first released this £40 thousand pound production in London, England, on the exact same month Mohandas Gandhi was arrested in India for protesting against alcohol and foreign cloth -- August, 1933. (2) Loosely translated, this project was entitled 'Cleopatra Diamond' in Finland; 'The Risen' in Portugal; and 'The Living Ghost' in France. (3) The majority of this movie was shot at 'Lime Grove Studios', Shepherd's Bush, situated within the English city of London. 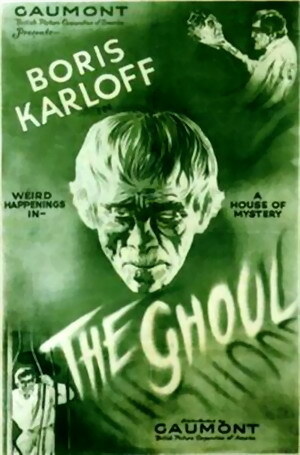 (4) According to modern day consensus, this was the first British horror film ever made with sound. (5) One of the taglines used to promote this picture, was, 'Weird Happenings in a House of Mystery'. (6) This was the first time the venerable English actor Ralph Richardson appeared in a full length feature film. Two other actors who also first featured were Cedric Hardwicke and Ernest Thesiger. 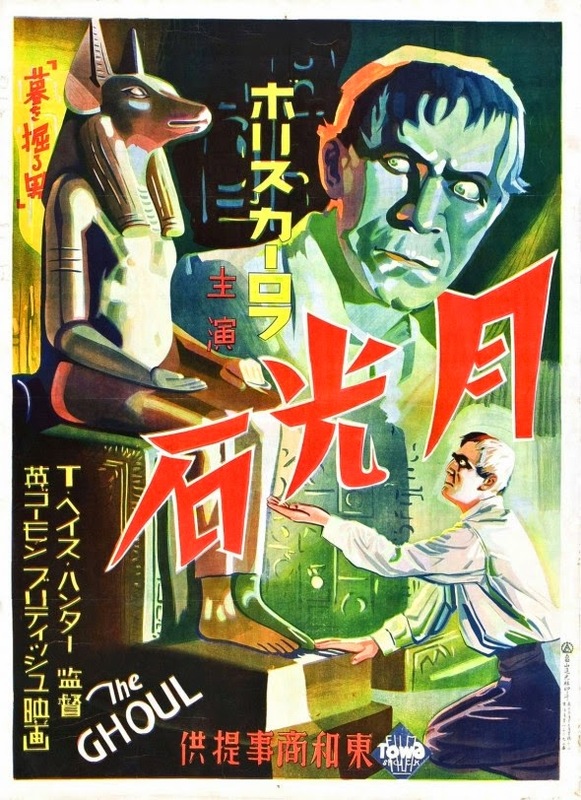 (6) When Boris Karloff traveled to the UK to shoot this movie, it was his first time in over 25 years he visited his home country, plus it was his first time he ever appeared in a British movie. (7) This slice of cinema was presumed lost for many-many years until it was finally patched together using recovered and reconditioned footage, taken from a haulage discovered in Prague, in 1969. 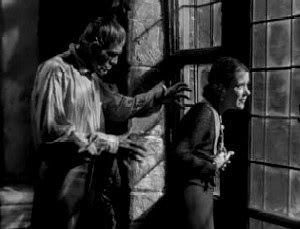 (8) After this adventure hid behind the curtains, Boris Karloff starred in the war-time drama, 'The Lost Patrol'; Cedric Hardwicke starred in the Turkish-thriller, 'Bella Donna'; and Ernest Thesiger starred in the musical, 'The Only Girl'. 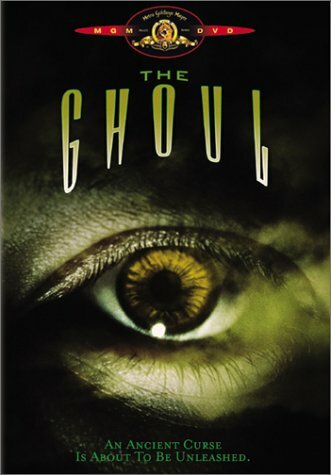 Overall I'd say 'The Ghoul' is a horror classic for die-hard horror-fans and movie-buffs only. Despite it not being a very lavish or spectacular production, in essence, this was one of those films that set a standard, spread some joy, and made us film-freaks appreciate film even more.